Brendan Fraser Not Taking Another ‘Journey’? / It's Just Movies Brendan Fraser Not Taking Another 'Journey'? Brendan Fraser Not Taking Another ‘Journey’? Call me crazy, but these days Brendan Fraser doesn’t like the type to turn down an easy paycheck when it’s offered to him. “The Mummy: Tomb of the Dragon Emperor” and “Extraordinary Measures” seemed to prove this theory while the trailer for “Furry Vengeance” pounded it into audiences’ skulls like a Neanderthal’s club (insert droll “Encino Man” reference here). However, apparently the actor still has an iota of integrity left, as he has chosen to walk away from New Line and Walden Media’s proposed 2011 “Journey to the Center of the Earth” sequel, which is now being rewritten to act as a starring vehicle for Josh Hutcherson, who played Fraser’s nephew in the 2008 original. Deadline reports that the impetus for Fraser’s abandonment of the project was the studio’s decision to hand the directorial reigns over to Brad Peyton, as opposed to the first film’s helmer Eric Brevig. Apparently, the top brass is uber-enthusiastic for Peyton’s efforts on their upcoming kiddie prestige picture/waking nightmare “Cats and Dogs 2: The Revenge of Kitty Galore” and are eager to recapture that same 3D magic/torture. I’m not gonna lie, this news story makes me sad. Really sad. 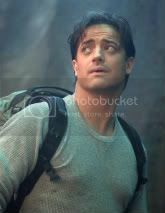 When he’s giving it his all, Brendan Fraser can be a truly talented actor and has given a handful of memorable turns in adult fare like “Crash,” “Gods and Monsters” and “The Quiet American.” He’s also done solid comic work in middle-of-the-road flicks such as “George of the Jungle” and “Blast from the Past.” While his current ungodly residence in crappy family movie purgatory seems to be something of his own doing, his career is far from redemption. The right indie film or television role would be all that’s required to get him back in the public graces. Preferably sooner rather than later. As for a follow-up to “Journey to the Center of the Earth,” I’m utterly apathetic. I steered clear of the original film and just can’t quite see myself tap-dancing in line for the sequel. That said, I am curious what you IJMers think of the first film. Is it decent or at all worth seeing? Would another installment interest you in any way, shape or form? Journey on over to our comments section or our forums and let me know if I should be scheduling a trip to the video store in the near future! Furry Vengeance should have been.Do this sequel,keep your name in the big openers, and do an indie to show off your serious acting skills.BF is awesome,I don’t want to see him disappear again. yea it would be nice if he stays, but if he doesnt. They will probably just write out the character or recast. Hopefully he can get on a good picture.